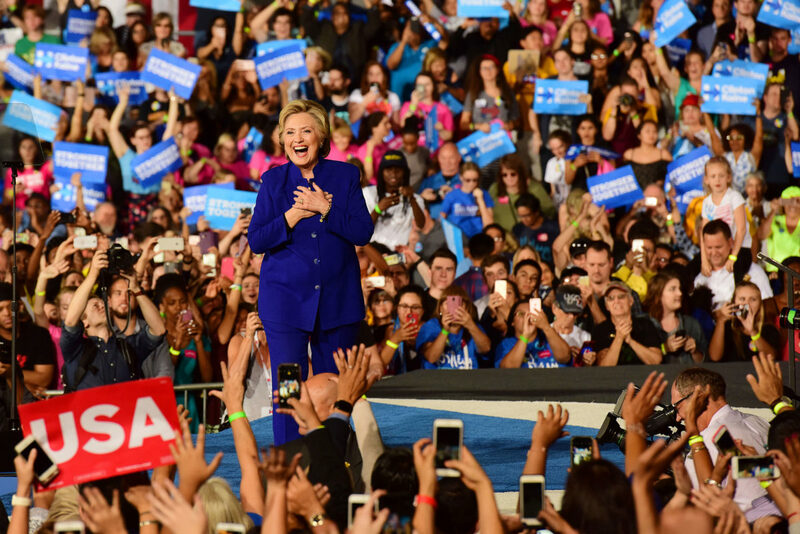 Democratic presidential nominee Hillary Clinton bids an adoring crowd farewell after the conclusion of her speech during a campaign rally at Arizona State University in Phoenix on Wednesday, Nov. 2, 2016. After introductions from U.S. Rep. Gabrielle Giffords, U.S. Rep. Ann Kirkpatrick and others, Clinton delivered an impassioned speech on topics such as education, climate change, LGBT rights, gun control and challenged derogatory comments made by her opponent throughout his campaign. 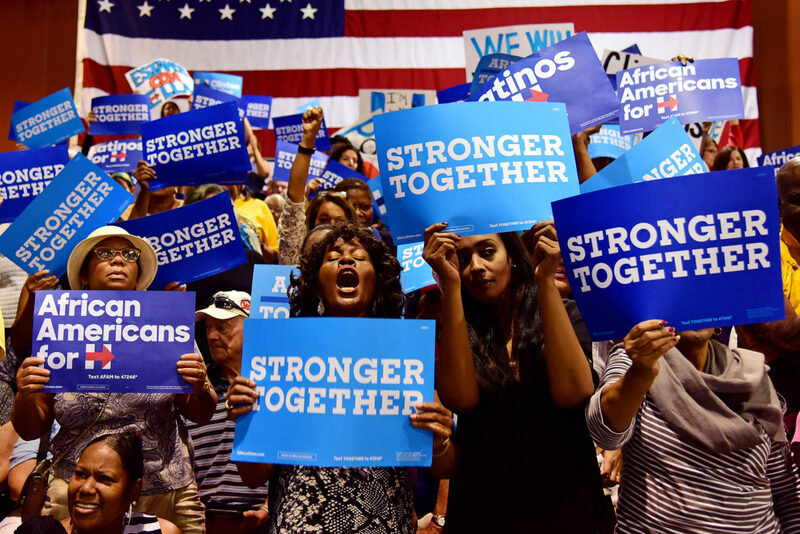 Derosette McClain (center) chants with fellow supporters before First Lady Michelle Obama's speech at the Phoenix Convention Center in Phoenix on Thursday, Oct. 20, 2016. 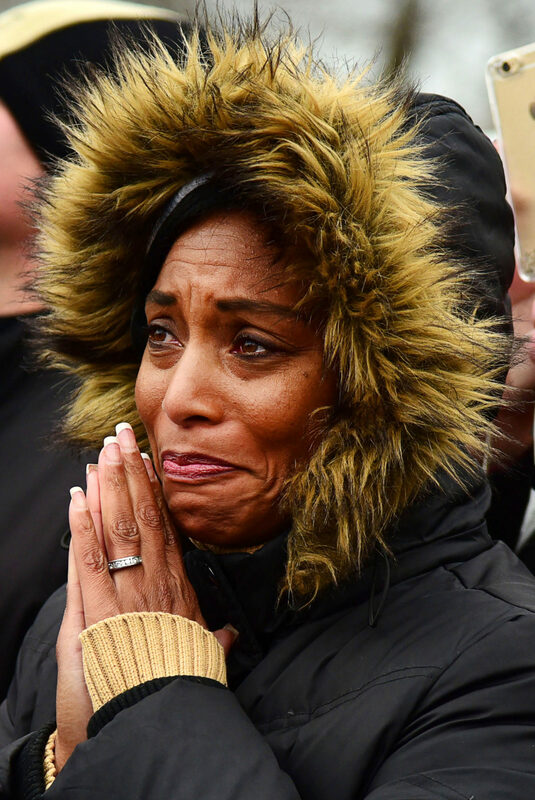 "Hillary has my full support," said McClain. "The support, the encouragement she gives to women - it just doesn't get any better." 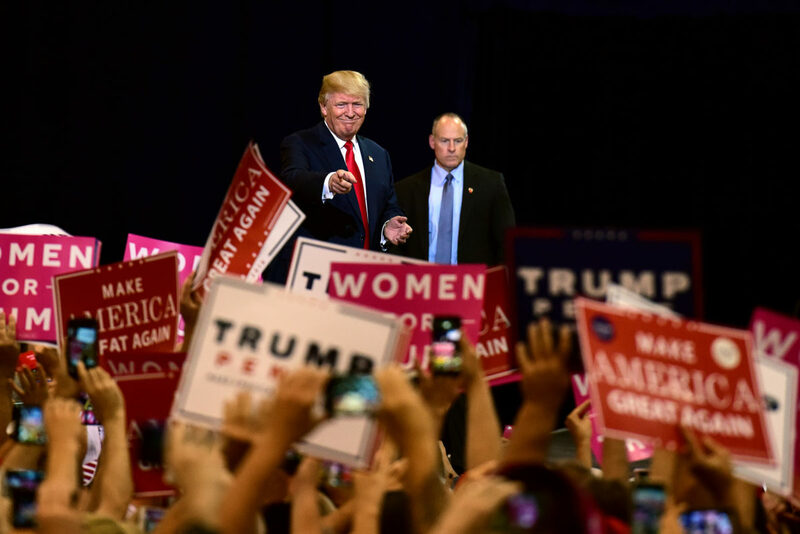 Republican presidential nominee Donald Trump flanked by a secret service agent greets an excited crowd during a campaign stop at the Phoenix Convention Center in Phoenix on Saturday, Oct. 29, 2016. Before Trump took the podium for his final campaign stop in Arizona, Gov. Jan Brewer, Sheriff Joe Arpaio and Carl Mueller, father of Kayla Mueller, a U.S. citizen captured and murdered by ISIS in 2015, spoke on the candidate's behalf. George Lindell goads members of the media hours before Republican presidential nominee Donald Trump's speech at the Phoenix Convention Center in Phoenix on Saturday, Oct. 29, 2016. Lindell's comments made national news after he was captured in multiple videos chanting a white supremacist sentiment, "Jew-S-A," at journalists. Republican vice presidential candidate Gov. Mike Pence listens to a question from an audience member during a town hall-style rally at the Fox Theater in Tucson, Arizona on Tuesday, Aug. 2, 2016. 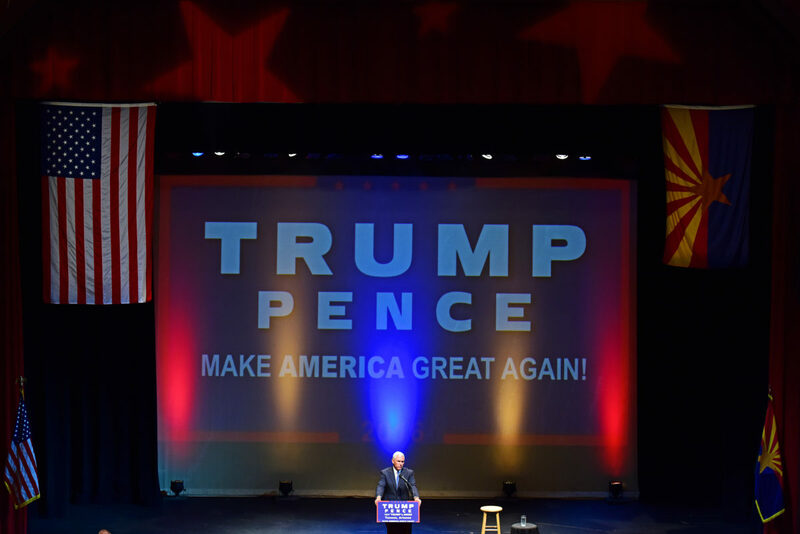 Pence's visit came two weeks after the announcement that he would run alongside Donald Trump and drew a crowd of 1,000 on a rainy Tuesday afternoon. 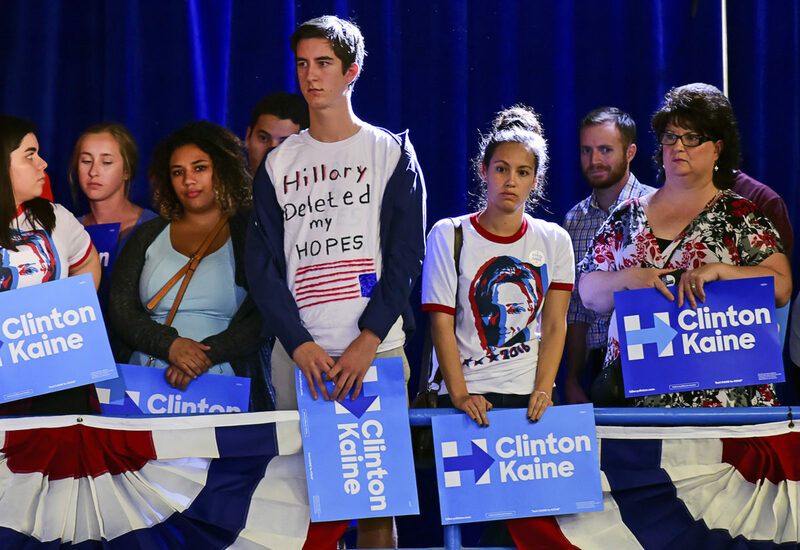 A young woman eyes a young man in a hand-drawn shirt reading "Hillary deleted my hopes" decorated with an inverted American flag during a speech from Democratic vice presidential nominee Tim Kaine at Sunnyside High School in Tucson, Arizona on Thursday, Nov. 3, 2016. Kaine campaigned in Phoenix entirely in Spanish earlier that morning to encourage citizens to get out and vote and delivered an identical speech in English in Tucson that evening. 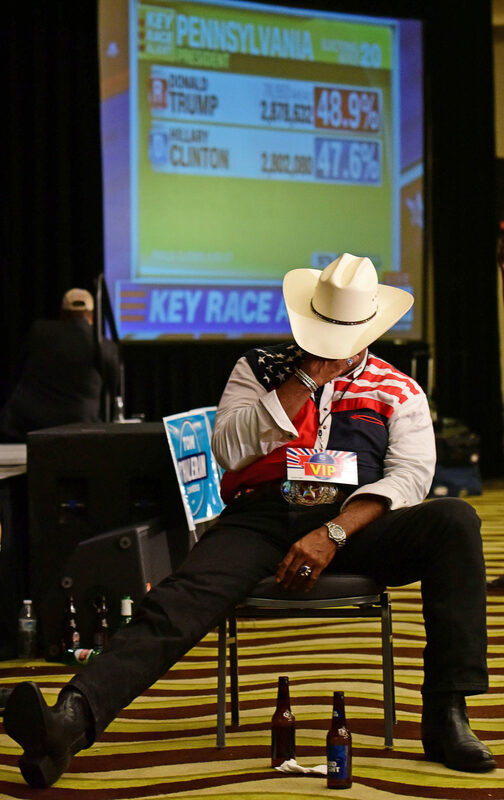 John Goodie, a member of the Mesa MLK Committee board of directors, hangs his head as Republican Presidential nominee Donald Trump secures Pennsylvania's key electoral votes during the Arizona Democratic Party's election night watch party in the Renaissance Hotel in Phoenix on Tuesday, Nov. 8, 2016. "I've seen the first African American president. The Cubs won the World Series. I was looking for the trifecta tonight," said Goodie on Trump's win. Protestors clasp hands in the middle of a street as Los Angeles police officers force the Trump protestors away from City Hall under threat of arrest around 1 a.m. in Los Angeles on Sunday, Nov. 13, 2016. On Saturday, over 10,000 protestors shut down highways and streets across Los Angeles in part with national protests against President-elect Donald Trump. 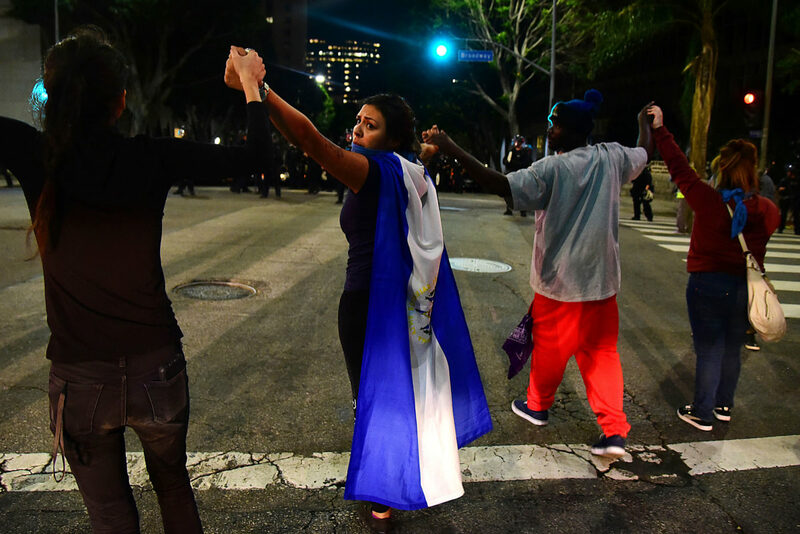 Smaller protests continued in downtown Los Angeles throughout the night. 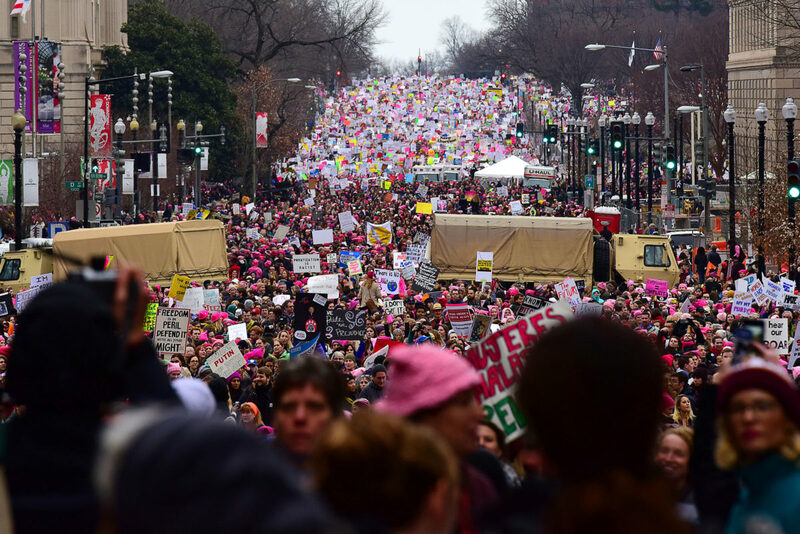 The Women's March on Washington floods downtown Washington, D.C. on Saturday, Jan. 21, 2017. 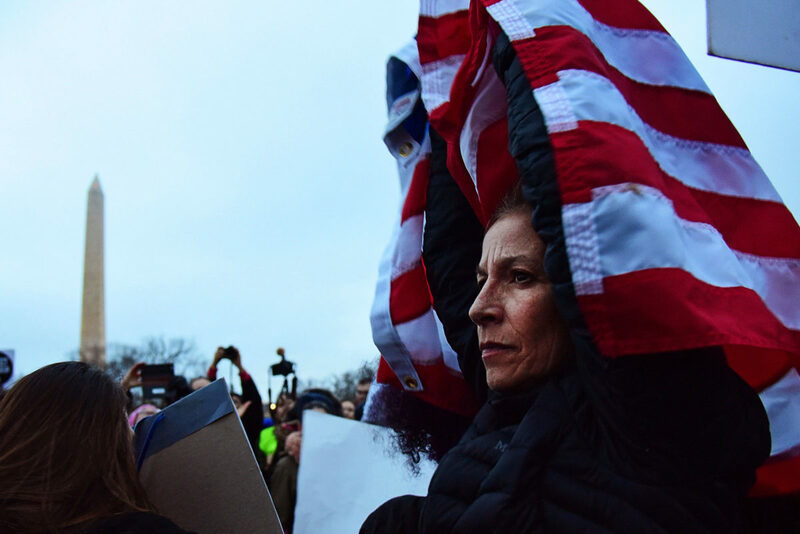 A protestor lifts an American flag on the National Mall during the Women's March on Washington on Saturday, Jan. 21, 2017. 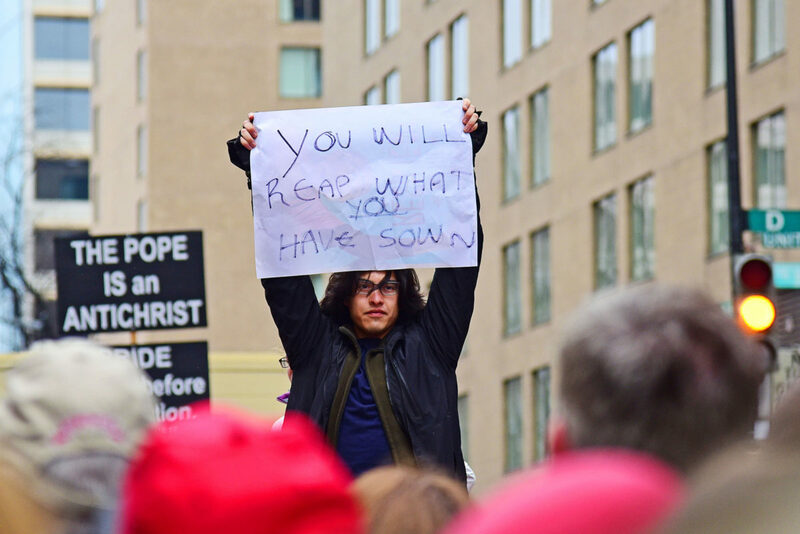 A protestor holds a sign reading, "you will reap what you have sown," as Trump supporters file out of the inauguration of President Donald Trump in Washington D.C. on Friday, Jan. 20, 2017. Shortly after this moment, a Trump supporter nabbed the sign from the protestor and refused to return it. Arizona ultimately voted red. Donald Trump became President Trump. The protests began. There were small demonstrations in Tucson. A friend and I hopped in a car and drove to Los Angeles to cover the larger protests for a weekend. I spent a day in Nogales asking residents on both sides of the border what their take on this new chapter of American history was. My school gave me a last-minute travel grant to attend President Donald Trump’s inauguration and the Women’s March on Washington. The fall of 2016 was a whirlwind of American history. 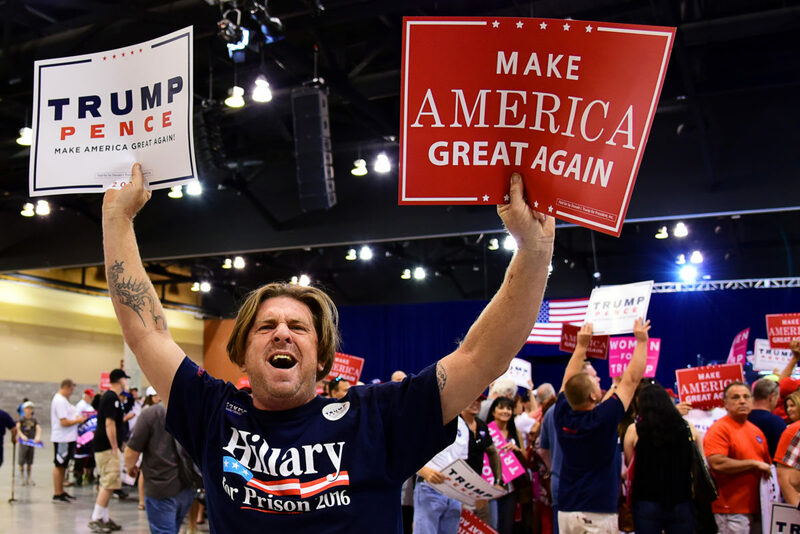 I’d heard photographers classify politics as live theater, and what I encountered over the course of my first election cycle was just that. I saw the unadulterated hate for the opposing side and firey hope for one’s own party grow exponentially. It was unforgettable to cover this historic election and see firsthand the deep division in this country during some of my formative years as a visual journalist.